As farmers we tend to believe that once maize has grown tall and gone into seed and fruiting that our job is complete. This is really not the case as there are still many possible challenges that may creep in and cause devastation to your crop. This cannot be our mentality especially in a market where prices are down. We need to put our focus into harvesting the highest possible yield of the highest possible quality grain. To do this we need to be prepared for these challenges and plan ahead. Regular field inspections are crucial as you need to be aware at all times what the condition of your crop is. Also make sure to inspect many areas of the field as sometimes a problem could be isolated in a specific area. So, what are we looking for? There are certain things that you as farmer should always be on the lookout for. Disease is the number one problem that can have devastating effects on your crop and thus your yield and quality of grain at harvest time. The most common problem that you may come across is rust on your leaves. This is identified by small brown speckles that develop in streaks on the leaf. They will start out as a few small spots but then eventually develop into big streaks across the entire leaf causing big damage to your energy producing surface area of the leaf. Be on the lookout for Ear rot and Stalk rot. This can be identified by noting rotting sections of a maize stem as well as rotting mould on the ear itself which occurs in between the kernels on a cob. This causes lodging and will have a negative impact on your yield and grain quality. Grey leaf spot and Leaf blight is another common disease to be on the lookout for. These have a direct impact of the leaf of the maize plant. Remember that the leaf of a plant is like a factory which provides the energy for a plant to grow and the cob to fill with kernels. If the factory is damaged then inevitably your maize development is jeopardised. If you suspect any of these may be starting to develop on your plant you need to act as quick as possible. 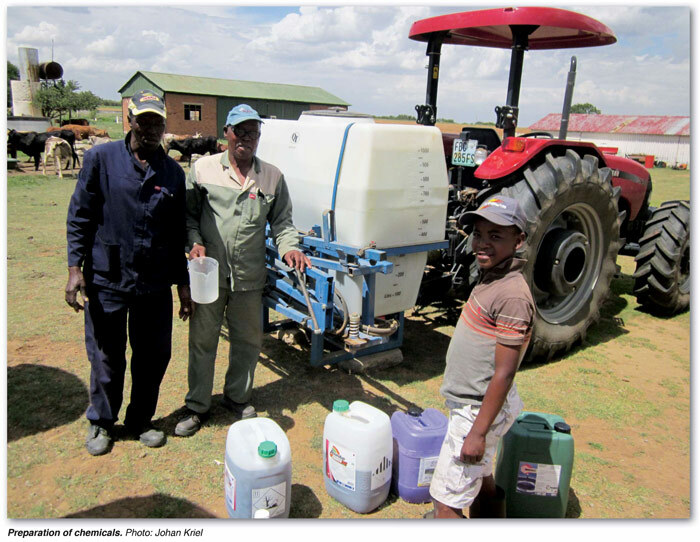 Your first action should be to call in the assistance of a chemical representative who should be knowledgeable on most common diseases in maize. He will also be able to help you to plan a course of action to deal with the issue. You may need to spray a fungicide which he will be able to advise on. If maize is tall and in its later stages of development you might need to contract the use of an aircraft spray or a high-rise spray rig to apply the chemical. The cost of this may be worthwhile if it saves your crop. Smaller areas can be treated at all stages with the use of a knap sack sprayer. Another thing to always be on the lookout for is pests in your maize. Just like diseases, pests too can have a devastating effect on your crop. Common pests one should look for are stalk borer also known as Earworm. Moths lay eggs on the upper layers of plants. When the eggs hatch into caterpillars they start feeding on the plant. They can cause damage to the silks on the ear which has a negative effect on pollination and this can also result in the presence of mycotoxins in maize. Stalk borer will need to be controlled by chemical pesticides. Here you should also consult your chemical representative for advice on the best course of action. Usually one would only consider doing this when there is a severe outbreak which will have a negative economic impact on your yield. Another pest which has become more prevalent in recent years is Armyworms. Armyworms can occur in large numbers especially when good rain follows a dry period, much like we experienced last year (2016/2017). Young plants may be defoliated or killed. Older plants can outgrow damage but yield may be reduced. 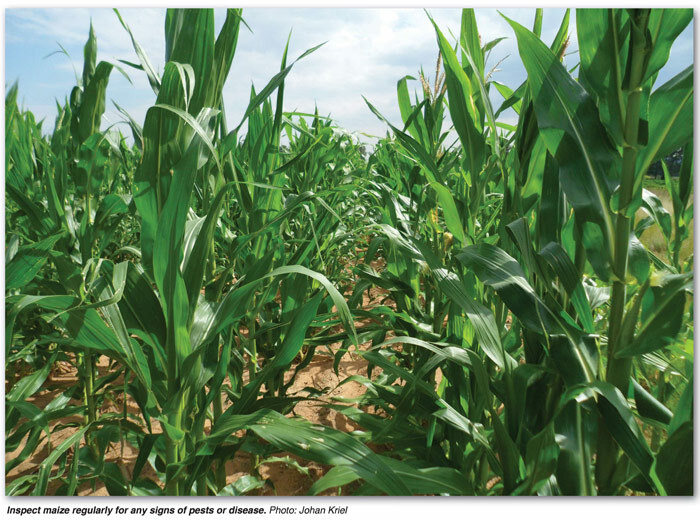 Many chemicals will control armyworms but their effectiveness is often dependent on good penetration and control may be more difficult in high-yielding thick canopy crops such as maize crops planted in 90 cm row spacing in KwaZulu-Natal. To deal with armyworms one should again consult with your chemical representative to find out the best pesticide to apply and the best method to apply it. These are just a few of the many challenges that we may be faced with in the later stages of the growing season. The primary goal of this article is to make you as farmers aware that one should not sit idle at these stages but rather continue with active monitoring throughout the season. Be ever present in your maize fields. Quick detection of a problem leads to quick action which could save you thousands of Rand’s or even the loss of an entire crop.